What to do when injured by boat | Lance P. Richard, P.A. What Should I do if i've been injured on a boat or personal watercraft? In Florida you can go boating or use a personal watercraft year round. Injuries and deaths from boating accidents and personal watercraft crashes happen all the time, often because other boaters and boat operators fail to take their responsibilities seriously. Property is damaged, people are injured, and some people lose their lives on boats and personal watercraft. When you are dealing with enormous and very powerful motor vessels -- often captained by people who have absolutely no experience behind the wheel of a boat or a rental Wave Runner -- people are going to get seriously injured. The US Coast Guard's recent Yearly Statistics on Recreational Boating Accidents counted 4,158 accidents that involved 626 deaths, 2,613 injuries and approximately $42 million dollars of damage to property as a result of recreational boating accidents nationwide. Florida's Fish and Wildlife Conservation Commission has compiled similar Yearly Statistics on Florida Boating Accidents with equally disturbing figures on boating accidents and deaths involving boats in Florida waters. A boat's owner and the driver or operator can be liable for your injuries. Drinking or Boating Under the Influence in violation of Florida's BUI Laws. Jet Ski Accident and Watercraft Accident Claims. What should I do if I’m injured on a Personal Watercraft-Wave Runner-Jet Ski? Riding a personal watercraft (PWC), like a Jet Ski, Sea Doo or WaveRunner can be an exhilarating experience, but it can also be very dangerous. Inexperienced or inebriated operators can find themselves in a Jet Ski accident with one wrong move. Injuries sustained during watercraft and Wave Runner accidents can be far more severe than those suffered in larger boating accidents, given the exposed nature of the rider. While Jet Ski accidents and watercraft accidents can result from the negligence of the operator, defective equipment, or other boaters can contribute to the cause of the accident. Parties that may be liable for damages include negligent vessel operators, the Jet Ski - Wave Runner rental company which supplied the equipment, or the manufacturer for selling a defective and/or poorly designed watercraft. 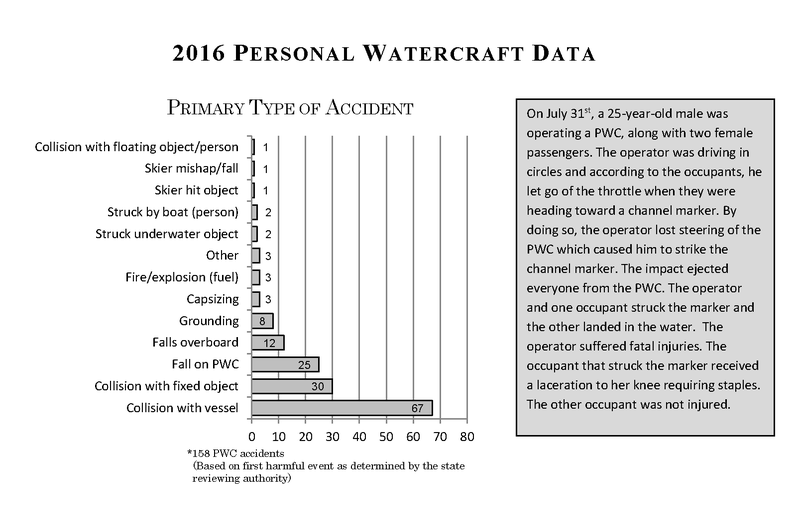 FWC's Personal Watercraft Statistics for 2016 show the majority of all personal watercraft accidents involve crashes with another vessel or a collision with a fixed object. If you have been injured due to the negligence of a boat operator, you may be entitled to compensation in the form of payment of medical bills, lost wages, as well as pain and suffering associated with the accident. Many boating accidents in Florida occur on "navigable waterways" which are governed under the jurisdiction of Federal Maritime law. Often these cases have very unique procedural rules and special laws which can significantly impact the outcome of your case. If you or someone you know has been injured in a boating accident, it is critical that you consult with a Florida boating accident lawyer promptly. You need a legal team that is experienced and knowledgeable with these types of cases. Call us 772-223-9600 or go to our firm's Webpage on Boating and Watercraft Accidents to learn more about how our firm can help you move forward with one of these unique and difficult cases.